This quick oil painting is a preliminary color sketch for a new coastal landscape painting that I will be starting soon. I wanted to use limited color to evoke a mood for this coastal scene. This marine art subject matter is a favorite of mine that I came across years ago on Cape Cod. 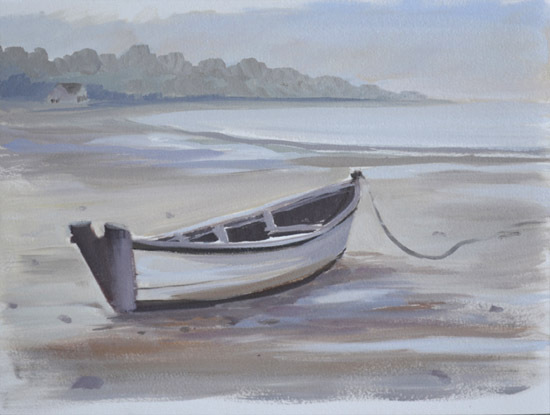 It is low tide with a small boat sitting on the sand. The sketch is painted on Arches cold pressed paper made for oil paint. It is the first time that I have used this oil pad of paper. Arches is my favorite watercolor paper that I have used for many years. I liked how the paint soaked into the paper as I was painting and it was easy to complete this quick painting. The canvas I am painting this coastal landscape on is 20″ x 24″. I put a grid on top of the oil sketch after it was dry in pencil and then put the same grid on the canvas and drew the boat onto the canvas. It is a simple technique to duplicate a drawing onto another surface. The sketch pad is 9″ x 12″ and much smaller than the canvas.